One night after going toe-to-toe with #1 Denver, before falling in the final seconds, #6 BU turned in what Coach David Quinn called “a poor performance” suffering a 3-0 shutout at the hands of #11 Providence. Despite being outshot 15-9 in the first period, BU had several good scoring chances, including a shot by freshman Shane Bowers from just outside the crease that was stopped by Hayden Hawkey. Providence scored all three goals in the middle period. An unassisted goal by Vimal Sukumaran two minutes in proved to be the game-winner. Erik Foley scored a 5-on-3 power play goal at the 11:18 mark and Brandon Duhaime beat sophomore Jake Oettinger just a minute later. 2018 recruits Tyler Weiss (photo) and Joel Farabee scored first-period goals to stake the NTDP U18s to a 2-0 lead over Adrian College. 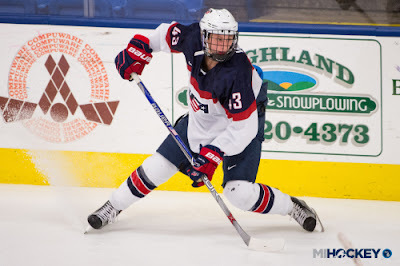 Fellow recruit Jack DeBoer assisted on a third USA goal, as the U18s went on to a 4-2 win. 2019 recruit Robert Mastrosimone scored his third goal of the season in USHL Chicago’s 5-3 win against Sioux City. The goal gave the left wing from East Islip, NY points in four of the Steel’s past five games. Clayton Keller scored his eighth goal of the season—tops for NHL rookies—but the Coyotes were edged by New Jersey, 5-4. Keller’s unassisted goal, after stealing the puck from 2017 overall #1 draft pick Nico Hischier at the Devils’ blueline, had given Arizona a 3-2 lead late in the second period. 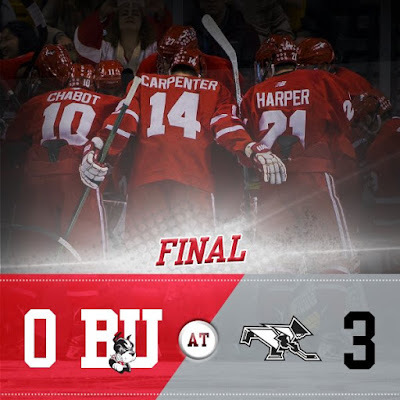 A third-period rally fell short as the Terriers fell to rival Boston College, 4-3. 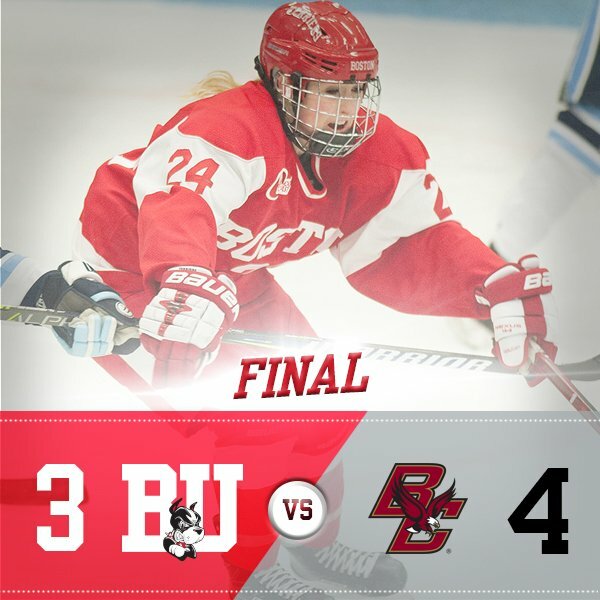 Senior Captain Rebecca Leslie scored twice and added an assist, as BU fell to 1-5-0. Mary Grace Kelley had the other BU goal and senior Victoria Bach assisted on two goals. BU returns to the ice today visiting New Hampshire for a 2 p.m. start. The game can be viewed on a free live stream.